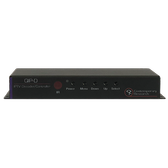 The Contemporary Research ICC1-232 provides access to power control, channel tuning, volume control, and local control lockout via RS-232. 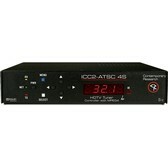 This unit is designed for use with flat panel displays that are equipped with a built in tuner. 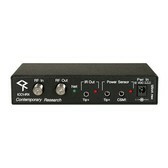 Tuning options include analog and HDTV format channels, as well as AV inputs. 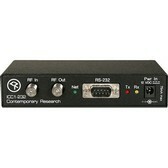 The ICC1-232 receives 1-way individual and zone commands from a single RS-232 port on the ICE-HE head end controller. High-speed 1-way control is possible through the same RF cable that carries the TV channels, creating networked operation of distributed media systems without adding control wiring. Compatible with the Contemporary Research Display Express software, the ICC1-232 can be networked with up to 4000 display controllers. For custom systems applications, the ICC1-232 and other CR display controllers can be accessed from a single RS-232 or Telnet port on an ICE-HE Ethernet Head. Applications of use include media distribution and control for educational television systems, theme parks, museums, government facilities, arenas, convention centers, airports and corporate video networks.